From the publisher: What is really going on at Italy City Hall? As publisher of the Italy Neotribune I have watched, generally from afar, the operation of the City Government of Italy. It has been a wonder to behold. We have a new mayor that would like to make some changes. Changes are always tough and he is getting a lot of push back. Obviously being Mayor is new to him and he is making many people in the administration upset. There is often two sides to most questions and here are some of my observations. There is a battle between the mayor and the police chief. From where I sit there are some serious issues from the police chief that bother me greatly. 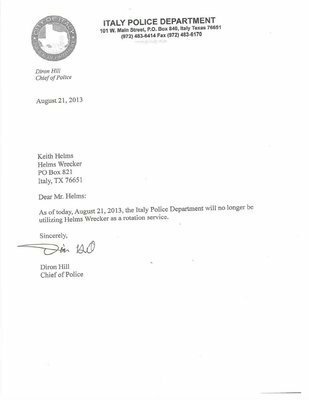 See this letter sent to Helms. It is very short with no explanation. Consider that Italy has two tow businesses. And consider that one is owned by a City Council Member. If you shut off the other one (Helms), you double the work sent to the council member. The council member also happens to be over the police department. HMMMM what is going on? — and with no explanation it really smells. It is from a police legal group. As you can read, pretty serious. It seems downright heavy handed. I truly wonder if any of this has been discussed by those involved. Certainly nothing has showed up at the city council meetings. In the world of politics nothing is as effective as a good attack. Why this attack? Does the mayor not have certain rights of administration? Where is this going? Lastly, I have asked for open records twice. I was asking for the budget. The city complied (the first one was just totals). I had not told them what I was really wanting to look at but a bunch of totals tell nothing. The second set of records were about the same. 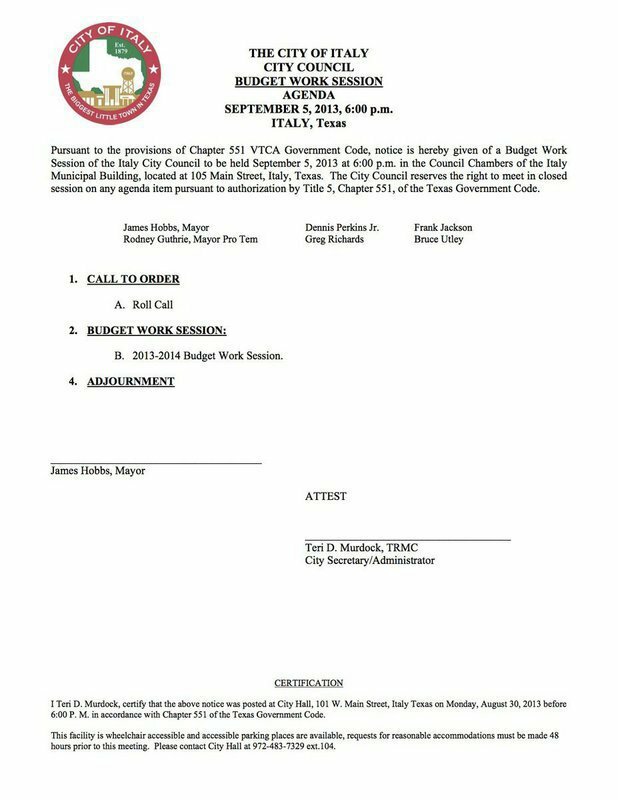 It is supposedly for tonights budget meeting. It tells almost nothing more. It does not have details such as how much is going to be spent on the streets, the water, the police — other than in totals. What I was wanting was details. One of the details I wanted to see was police pay details. 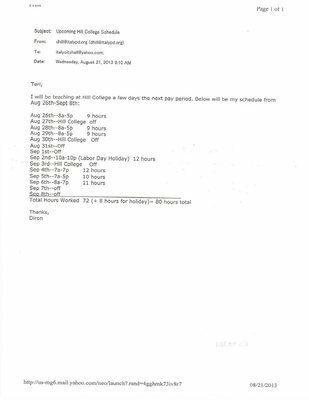 Remember this is all supposed to be open records to anyone that wishes to see it. It is my understanding that the police chief is supposed to get a 18.5% raise with this budget. I would like to see if all the other people working for the city are scheduled to receive that much also. Who decided this? Where is the openness? Meetings like tonight’s are to be open. They are not to be pre decided and then totaled and then stamped only at the meeting. Over the last year and more we at the Neotribune have seen more and more behind the scene action and not openness that should be the hallmark of the city administration. Please, lets see this turn around. Years ago we recorded and played the actions of many of the meetings. We can see we may have to go back to doing the same again and loading them up for all to hear and or see. The Italy Neotibune was not started to be a watchdog of the community. It is to report the goings on. We have tried to maintain that position. Neither the City nor the School is asked one dime to help pay the cost of the Neotribune. To our city leaders and administrators, please, please, please monitor yourselves and let us report as a service to the community. What exactly are we squabbling about? Is the squabble about personal agendas or about the betterment of Italy? Isn’t time to resolve the pettiness and get to the business at hand, improving our town? 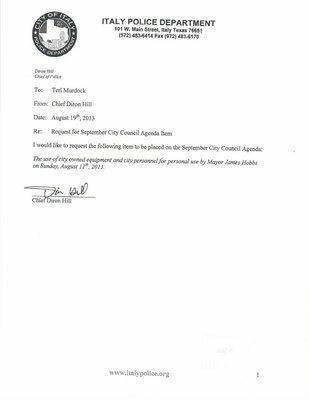 * Why was Frankie Jackson appointed to City Council without approval from the Italy residents? He ran for mayor and lost. He did not run for city council. Steven Farmer would be the next in line. * Why is there so much hesitation by city employees with the new mayor? He was elected—fair and square. His is the new boss now. It is time to face facts. * As a 26 year Italy resident, I am embarrassed of my city government. I moved here by choice and it won’t be too long before I move out of Italy and Ellis County— by choice. What will stop me from moving? I recently ran for City Council because I have seen personal agendas brought forth by city officials and I wanted to hopefully change that. However, this isn’t the reason I’m commenting. First I would like to address the Helm’s situation. I, as a citizen, would like to know why Mr. Helms has been taken off the rotation? The letter should have stated a reason why he was being removed. What gives the Chief the authority to do this? Especially, when the Mayor doesn’t have any authority. 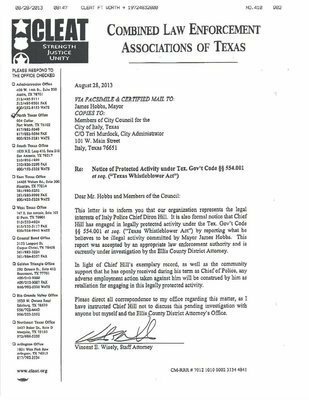 Second, this is addressing the letter filed by the Chief. Lets look at the events that have happened. The paperwork states that the District attorney will be investigating this matter. So does anyone know who the District Attorney’s investigator is? I have been told it is Manuela Martin’s husband. 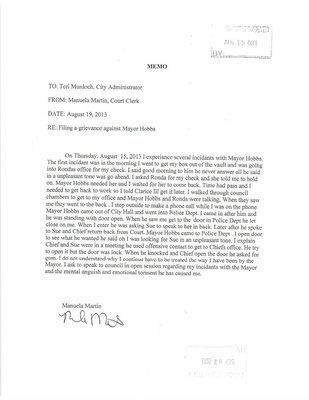 Doesn’t Manuela have a grievance filed on Mayor Hobbs? These are things that are hurting our town. The citizens really need to take a stand to this because the only ones getting hurt over all of this are the citizens and that’s not right. I hear from city council members all the time, “We care about the city and each citizen.” If you actually cared everyone would work together and stop all the fighting. Please find a common ground and start moving foward.